Whatever your record is for dropping your phone in the toilet in a single day, I bet you can’t beat mine. My phone fell out of my pocket and into the toilet three times in a single night, and I still use that phone to this day. Honestly, that’s not even the worst of it. There was another instance when I was washing dishes while talking to my mom. I adjusted my head just enough to have my phone slip and fall into a sink full of soapy water. Again, I still use that phone today. You’re probably wondering how a single phone could survive being immersed in water so many in times in such a short time frame. The answer is simple, proper prevention. Once certain parts of a phone are exposed to water, there will be damage, but if you act quickly, you can stop the harmful effects water damage can have on your phone. The absolute best thing you can do is take your phone to a phone repair shop immediately. The men and women there are trained to deal with issues like this and do so all the time. So while you’re in crisis mode, they’ll be calm, which will ultimately calm you down too. However, if this is unavoidable within a short time frame of being exposed to liquid, follow these steps until you have time to get your phone checked out by a professional. GRAB IT. Unless you dropped your phone in acid, you need to remove it from the liquid as fast as possible! If that means sticking your hand in the toilet, then just do it. The longer your phone is immersed, the more water damage it will endure. Getting your phone out quickly is the best chance you have at saving it. Turn it off. We all know that electrical currents + water = sparklers (and not the fun kind). Shutting your phone down will prevent it from short circuiting, which could cause irreparable damage. Remove the battery (and any other obstructions). Water wants to find a place to go, so if it can’t escape the phone, it will recede deeper into it. By removing the battery, headphones, SIM card, and memory card, you are creating space for water to leave. Again, time is of the essence, so the sooner you can make way for water to escape, the better the chances are of reviving your baby… I mean phone. If you are lucky enough to never have dealt with any liquid other than water, you can skip to step 5. 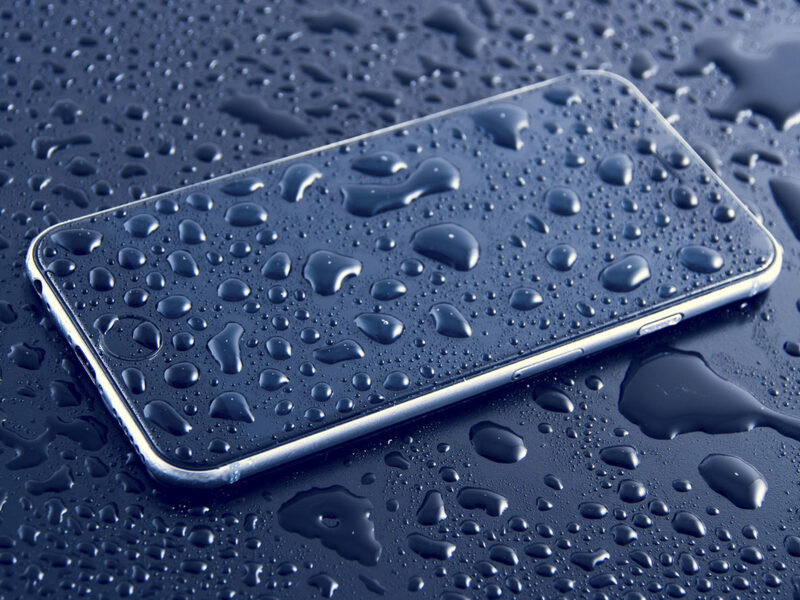 Rinse it out (If applicable) If you dropped your phone in something other than water, you will want to rinse it off. Water will get out whatever other liquid is rushing through your phone’s veins and is way less damaging. Drain and dry it. If you followed step 4, you will want to remove any water that you used to rinse it. This will be done by removing the pieces in order to allow water to escape. Then use a vacuum cleaner or blow dryer to remove any excess water on or near the surface. Submerge it, but NOT RICE. Submerging your phone in an absorbing agent might not actually help, but it definitely doesn’t hurt. Believe it or not, dry, conventional rice is not the most effective absorbing agent to get any excess water out of phones. The folks at gazelle.com submerged 9 phones of various brands in water and actually found that, contrary to popular belief, there are much better absorbing agents than rice. For more effective moisture absorption, try cat litter, silica gel, instant oatmeal, or instant rice. Don’t turn it on. Resist the urge for 24 hours to turn on your phone. Test it out. Even if it turns back on immediately, you may still see signs of water damage. If your phone doesn’t turn back on right away, you can try replacing the battery. Nothing worked. If you followed these steps and your phone is still unresponsive, you can try repeating the whole draining and drying process. If it’s still not functioning correctly you may have to bring your phone to a cell phone repair professional for an evaluation. Find your nearest Phones R Fixed location! I truly hope this article can help save some of you time and money. Huge shout out to gazelle.com for doing all the dirty work to test the results.